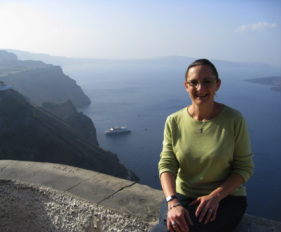 Tyler Jo Smith (Associate Professor, McIntire Department of Art) is a Classical Archaeologist who specializes in ancient Greek figure-decorated pottery, and images of performance and ritual in Greek and Roman art. She is the author of Komast Dancers in Archaic Greek Art (Oxford 2010) and the co-editor of A Companion to Greek Art (with D. Plantzos, 2012). Although she was introduced to invertebrate paleontology at a very young age – digging in the Arbuckle Mountains in south-central Oklahoma – her research area has long been focused on the Mediterranean world. She has participated on field surveys and excavations in southwest Turkey, excavations at Knossos (Crete), Kato Phana (Chios),and Thebes in Greece, and at Morgantina in central Sicily. She has participated in the House of Cadmos at Thebes project, under the direction of Dr N. Dakouri-Hild (UVa), and most recently in the excavations at Hacimusalar Höyük with Bilkent University and the University of Richmond. With Ethan Gruber, she the co-founder of Kerameikos.org, a linked open data project for Athenian pottery, and also heads the 3D-GV cohort focused on scanning and printing the Greek vase collection at the Fralin Museum of Art. At UVa, Dr Smith has served as the Director of the Interdisciplinary Archaeology Program (2011-17). Her courses include Introduction to Classical Archaeology, Greek Art and Architecture, Anatolian Archaeology, Art and Devotion, and Theory of Classical Archaeology. She has received both national and local teaching awards, and in 2008 was elected a Fellow of the Society of Antiquaries of London. Her current research is concerned with the Art and Archaeology of Alcohol across the ancient world, and in the representation of animals in Greek religion.